surprise that the Serendipity Arts Festival 2017 has received a great response, with people from every walk of life pouring in to the ten venues. 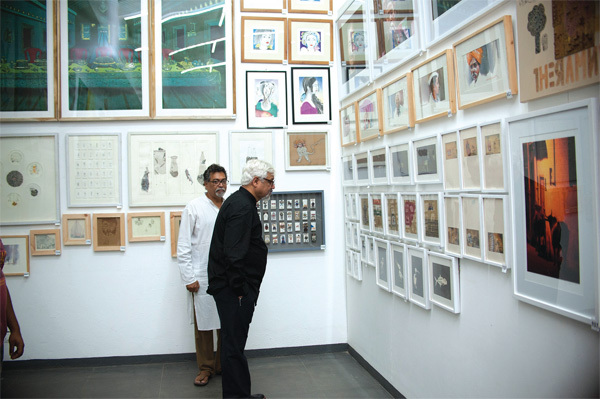 Simultaneously, there are various art and photography exhibitions taking place in Goa at various venues. Through this grand scale of visibility of art, the impact of this appreciation ripples across to various art exhibitions that are already underway in the state. The first edition of the Goa Affordable Art Fest (GAAF) is being held at Museum of Goa till February 28, 2018. This curated festival exhibits over a thousand quality paintings, sculptures, photographs and prints drawn from all over the country and abroad. All these works are priced within an affordable range of Rs 3000 to Rs 1,00,000, with the main objective to enthuse the audience to appreciate, collect and connect to art. The father-son duo of Subodh and Siddharth Kerkar have curated GAAF. “Serendipity Arts Festival is a big budget festival that is advertised nationally. This publicity attracts big art collectors and also a lot of people who come down to Goa in December. GAAF dates are clashing with the festival and here the artworks are on a platter for art collectors,” says Siddharth. In Panjim itself, three exhibitions are currently underway. Fundação Oriente in association with The Al-Zulaij Collection are presenting the exhibition ‘Goa/Lisbon/Mozambique: The Many Lives of Vamona Navelcar’ at Fundação Oriente, Fontainhas, Panjim till January 12, 2018. This exhibition displays 16 pieces that speak of the life and legacy of Vamona Ananta Sinai Navelcar, a contemporary Goan artist, whose studies and career took him to various locations in the Lusophone world, namely Goa, Portugal and Mozambique. Vamona’s art is representative not only of his personal genius, but also of a larger Goan reality. His art not only chronicles history, but also serves as commentary on Goa’s complex identity. Sooni Taraporewala’s photo exhibition, ‘Home in the City - Bombay 1977 - Mumbai 2017’ in collaboration with Sunaparanta, Goa is on display at Sunaparanta- Goa Centre for the Arts till January 2, 2018. the exhibition, curated by Siddharth Dhanvant Shanghvi, comprise photographs that are personal documents of the city’s eccentrics, children, culture, politics and much more. Since 1977, Sooni has photographed the city where she grew up. Her images, cutting across class and community lines, are an insider’s affectionate view. At The Cube Gallery, Moira, ‘Outsiders’, the visual arts show, is on display till January 5, 2018. It presents artworks by four contemporary visual artists, Sonja Weder, Thomas Louis, Sonny Singh and Alok Johri. Curated by Samira Sheth, the show celebrates the creativity and diverse perspectives of these ‘outsiders’, forging their own paths of artistic self-discovery in Goa. The Museum of Christian Art is hosting Sadhana - an exhibition of spiritual artworks by Clarice Vaz at Church of Santa Monica, Old Goa till January 2, 2018. Saligao based Clarice is a self trained contemporary abstract artist who has experimented with fluid and spin painting techniques. She has created her own unique style, which she calls syringe painting. Curated by Lina Vincent Sunish, Sadhana is a dramatic presentation of colour and composition. The proceeds from the fund raising exhibition will go to the Museum of Christian Art’s Refurbishment Project. Noted Goan artist Yolanda De Souza is currently having an exhibition of her recent works, titled, Monsoon Clutter, which is on display at Art Chamber Gauravaddo, Calangute till January 10, 2018. “This collection is a body of 60 works created during the monsoons. They are random thoughts in small format watercolour. It’s all about Goa and my connect to it and sometimes, nostalgia,” says Yolanda.